In just two days, Happy Aquarium has replaced their St. Patrick's Day demo tank with the one you see above, which I've gotta say, is indisputably more awesome than the first one. We should've known something was up since that one was missing a "7-Day Hibernator". But this one does have it, so the tank will be around for another 6 days. Two of the items here used to great effect are the "Pot of Gold" and the "Shimmering Rainbow", which was first introduced as part of the Fairyland set back in February. But two other interesting innovations are the "Arched Rock Stacker" (image below) and the "Flat Rock Stacker" (not shown here). These "Stackers" can stack on top of each other, and then you can platform items on top of them. The "Arched" is 400 Coins, while the "Flat" is 300 Coins. 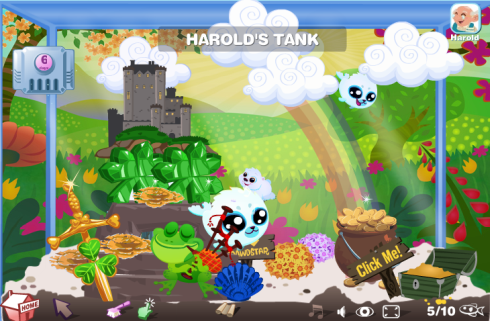 You can see how the "Irish Castle" item was raised high in this demo tank, using this method.